Looks like that tree frog has some unexpected company up there in the branches! I used Animal Outing and Around the Corner - two new stamp sets from Stampin' Up! So cute! 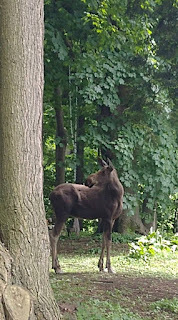 Meanwhile just a few blocks from my house there was also some unexpected company yesterday.....a sweet young moose! 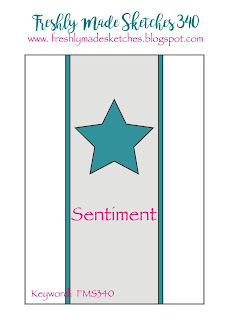 Karren's wonderful sketch will let your focal point shine! Use any shape! Join us at Freshly Made Sketches! 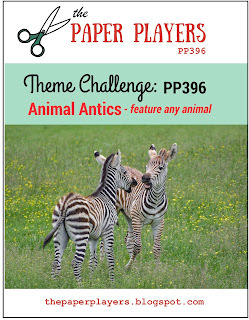 The Paper Players is having an animal theme this week! Cute! Cute! Cute! I love how you've used that corner stamp set with the sketch and the scene you've created. I can't even imagine seeing a moose in town, and living in Texas I'm sure I will never see it. This is adorable. I love it! This is a neat card! Love your layout. What a cool card! Love the design with the two critters saying hello. :) And how awesome to just run into a moose while strolling down the street! you have MOOSE nearby???? I am so coming for that visit!!! Had I known, we would have paid a little closer attention while driving through that neck o' the woods a few years back! Now let's talk about this little masterpiece of a card - I'm so happy you mentioned the frog, because I'd have been so sad to miss that cut little green guy! I'm tellin' ya, Linda: you are SO GOOD! Be still my heart! If this isn't the sweetest card ever. Love it Linda - the color palette, the design and the cute critters. LOVE this card! How stinkin' cute! This card is an instant smile producer...love it, Linda! Love the design and colors and wow, your camp spot looks so relaxing! Oh how cute is that giraffe! Such a wonderful card and perfect use of the sketch. That moose is pretty cool too! Love, love, LOVE this card Linda! Such a creative way to frame this fun pair using those corners - and the contrast of the black borders and bold stripes are just perfect!!! Thanks for playing along with my theme challenge over at The Paper Players this week! Fabulous! Can't wait to get my hands on Around the Corner--love how you used it to frame these sweet animals. And that moose...oh my!! 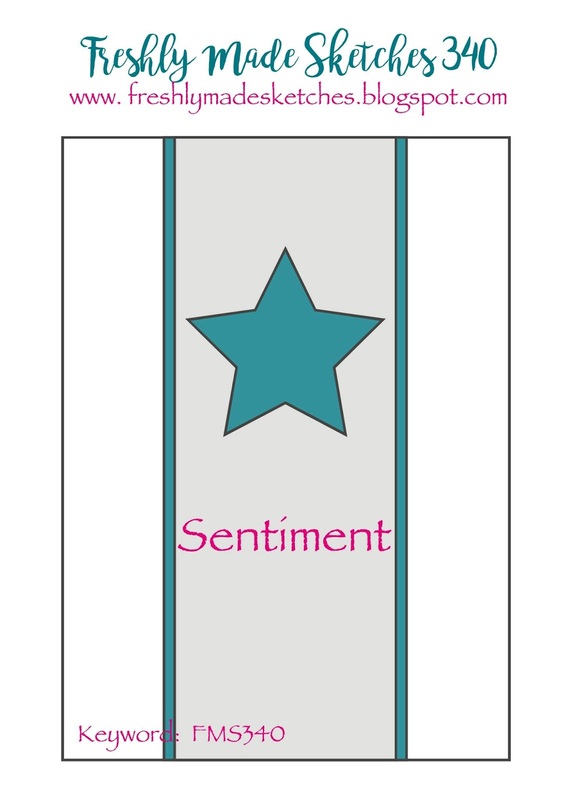 Love your adorable card! Who would think a little froggie could bring such a smile to my lips! Thank you so much for joining us at The Paper Players this week! 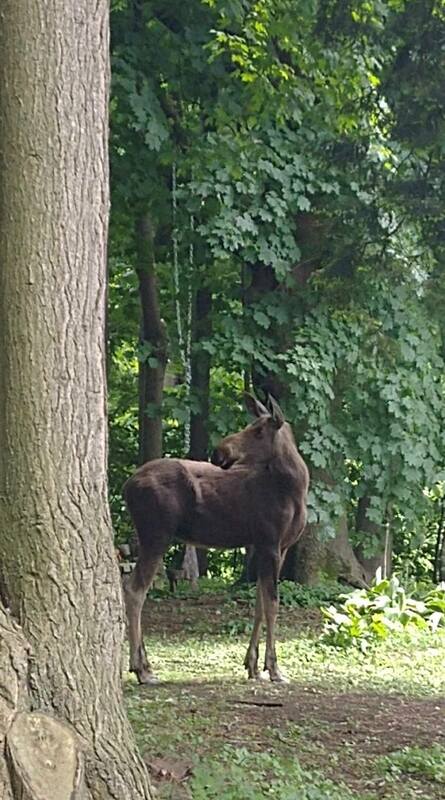 BTW...what a fabulous picture of a young moose...I can only imagine how beautiful it must be where you live! This is stunning, LInda. The way you've used the corner stamp to create a frame is fabulous and I think the choice of striped paper is genius. It brings out the giraffee's colouring and accentuated the long, narrow design. Thanks so much for joining us at The Paper Players this week. Linda this is gorgeous. I love the frame you created and all of that wonderful white space really highlights your fabulous focal image. Oh... and I love the photo of your visitor, too! Fabulous card! 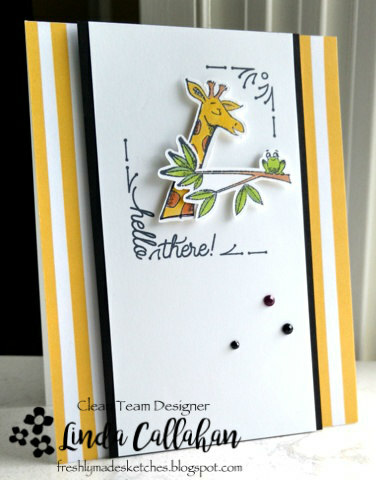 Love the colors (white, black, and yellow are faves of mine), but the giraffe and the frog steal the show! What a great pair they make! Adorable card. I love the color combo and your mix of animals. This is a fabulous card Linda! I just love that giraffe and the fantastic sentiment! That baby moose is also so very sweet! I love seeing wildlife enjoying it's natural habitat!